My journey has never been just me alone. This business I've built was with your help. I am honored to have you to inspire, support and encourage me as the years pass. This harvest season is wrapping up but the adventures never end. In the spirit of that - I want to share some thoughts on the 2018 vintage. When I began making wine in 2008, the growing season for Bordeaux (red) grape varieties typically began in late march and were harvested sometime in October or November. If I was working with the same grape and the same vineyard, the harvest date from year to year was consistent within a week or two. Sort of like pregnancy - the grapes had a due date that you could rely on. This is what I experienced until 2013 when the cistern on my property ran dry in late May. Water became a hot topic. Wells were going dry throughout the state. Farmers began drilling deeper to find water, sometimes unsuccessfully. The dry earth forced grapes into a ferocious state: conserving growth above ground while competing for water below. The extremes of summer heat pushed the grapes into ripeness months early. This continued for the next several years and the “new norm” was to harvest in August and September. Last year, I was harvesting Cabernet Sauvignon on September 1st. This year, my first pick didn’t happen until October 17th and even today as I type this, harvest isn’t quite over. Back to normal - for now. This vintage began last year when the drought finally relented and we had a nice wet winter, prepping the vines for their bloom in the Spring. Optimally, the biggest rains occurred before fruit set, soaking the lands that had been so thirsty for replenishment. Lakes and reservoirs were holding water again. Mother Nature took cue and held back on the rain once we got further into the Spring, allowing the berries to develop nice and slowly without becoming diluted or the vines over vigorous. Honestly, we’ve had a pretty righteous growing season; the even temperatures provided homogenous development of flavors without throwing any curveball heat spikes or damaging frost. Toward the very end of this season we got a rainy day. It was a result of a hurricane off the coast of Baja. This rain happened days before I was going to call my first pick and due to the grapes soaking up the water from the rain, the berries sugar levels dropped back down and pushed the picking date back into the future. I would wait another three weeks before finally determining the time was right. Vintage 2018 is exciting for more reasons than just the perfect season; vintage 2018 marks the 10th year for Turiya Wines and also holds some variety for your future cellar. After many years of working with Bordeaux grape varieties, this year I went for a few new grapes to add to your collection: Barbera, Lagrein, and Tempranillo. Each of these grapes, with their massive personalities have proven to be vastly different from each other thus far. These babies will be available for future/barrel tastings next year at the annual Spring Open House so I invite you to follow along the journey of these new wines as they develop into a beautiful ending for a beautiful vintage. I know it is early on but remember that Turiya is a micro-sized winery so there is a good chance that unless you are following me religiously, you may miss out on news like this when these wines are ready to ship out (I know, I know, 4-5 years is a long time to keep this on your radar). If you require a specific notice when these wines are released (and are not a member), please fill out the form and we will let you know once they are available. Remember, members get first option to max out the allocation and receive 15% off all purchases - to apply for membership click here. Already a member? Sleep easy, these wines are already in your future. Thankful isn’t quite the word. Grateful is probably closer. The overwhelming feeling of accomplishment I get when I think of the hard work it has taken to enter the wine business as a single mom with no prior winemaking experience. The appreciation for the losses in my life that led me to wine. The paths of creativity my endeavors have led me down. The lifelong friendships Turiya has cultivated and all the moments I am part of when Turiya is shared with you and yours. Thank you. I am so grateful. Ten years. This is the longest work relationship I have ever had. When I started this business my children were just 5 and 12. I was edging toward 30 and confident AF. I knew I was exactly where I was supposed to be in life. I still feel that. I remember dragging the kids along to vineyards up and down the Central Coast and the winery after school to do the last punchdowns of the day. They never seemed to mind. In fact, Trenton, my son, really enjoyed (and still does) doing punchdowns and smelling and describing the wine. My daughter, Veronica, is proud of me (I think ;)) for building this little business all on my own, for not giving up when those little moments of doubt creep in. Believe me, they do. I am proud of myself for sharing my story with others and proving that dreams are meant to be followed, yet respected. 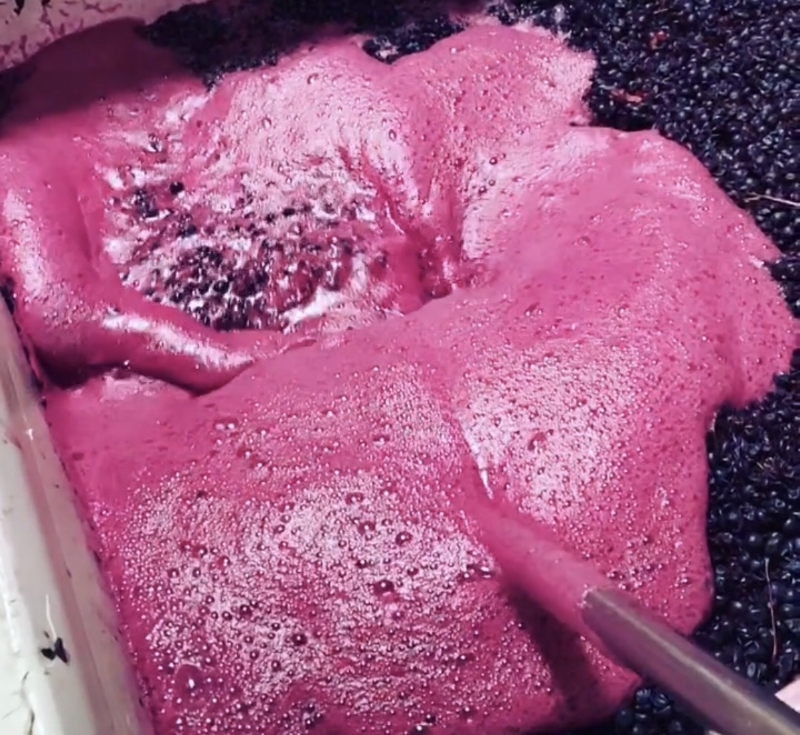 That being privy to the lifestyle of a winemaker isn’t all fermentation and glamour; it is being part of a community, it is paying attention to social responsibility and giving back and not taking anything for granted. My journey is worthwhile, and has now become my identity. When my bottles make it to your dinner table, I am there in spirit. I will always be Turiya - Turiya will always be me and THAT makes me grateful. I will be hosting a 10th Anniversary Library Event December 15th from 1-3. I know there are several people who still have the first vintage in the cellar. Before you open it, you can join in on a fun, exploratory tasting of the 2008 vintage wines from my personal cellar. RSVP here as the wine is limited. This event starts promptly at 1pm. I must tell you, even at wine events I get a lot of surprise when I announce that I am the owner and winemaker of Turiya Wines. Perhaps it is my staggeringly youthful appearance ;) (credit to drinking red wine of course), or that I am a single mother. Who knows? I have a sneaking feeling that I am not the typical image that has played over in the mind's eye of the wine drinking crowd: I do not come from money, no, my family was never in the business - except on the migrant farm-working side of it, and before I was 25, I didn't like wine. The truth is much simpler. I had a glass that I fell in love with and for me, love is a big deal. This story is often inspiring. We can all relate to love right? But I want to be honest - love doesn't pay the bills. Building a winery (or any business) is a lot of work, it is very expensive and can be a frightening to pull the trigger on. It is highly competitive but also highly rewarding. I believe most winery owners are wine drinkers first and I've been approached by several of my inspired fans to help them get into the industry. I'm excited to tell these fans that there is now a book that covers some of the most vital questions if you are truly considering starting up a winery. Turiya Wines is featured in the newly released book called The Winemakers Primer which is now sold on Amazon. The book is a straightforward, Q and A format, asking a variety of winery owners how they got into the business and the variety business models including the thoughts behind them. I encourage anyone who is considering jumping into the business to grab a copy of this book. Although I love technologies and the wave of the future, including the internet, there are times when I get bummed that life isn't as organic as it used to be. As you may know, I don't like to add chemicals to wine I make, I don't even like to filter it. I enjoy the true, raw, natural flavors that are found in each grape, each vineyard site, each barrel, and each vintage. I run the entire business with the same concept - I do not pay to have wine reviewed, I do not pay for Yelp advertising so that I can show up first on a competitors page. I don't manipulate my brand. Why would I do that? Just to get ahead? No. Remember it is about quality, not quantity. Here is my rant - Yelp, when it began was all about consumer reviews. It was when consumers had gained the ability to say how they feel about a place (and sometimes even a person) in an online community. It was the best word of mouth advertising businesses could find in the ever-evolving (like wine!) world we live in. Now, I am not against Yelp and find it to be very effective for both end users, however as a grass-roots organization my business relies solely on real reviews, and good ones! As proactive as I have been there have only been a handful (literally 6) reviews published on Yelp. Today I discovered there are 2 more 5 star reviews that Yelp won't publish. That means that 25% of users who review my site have been hidden. Not a big deal right? (As I was told by a Yelp employee). Wrong. I like the reviews and they are legitimate - so I figured I would publish them myself. Screw Yelp and their algorithms. The wine is top notch! Where else do you get to meet the person responsible for every bottle. Love the Syrah and Perpetual bliss, limited amounts made and very good! Definitely recommend calling and making reservations for tastings, you won't regret it. If you want to challenge Yelp and write a review that may or may not get published, click here!